Everyone experiences a dry mouth from time to time. You can develop a dry mouth due to a number of reasons – with the most common causes being stress and dehydration. Dry mouth happens when the salivary glands fail to work as they should. If you’re a smoker, abuse drugs and/or alcohol, or are undergoing cancer treatment (such as radiation and/or chemotherapy), it is not uncommon to develop dry mouth. Certain autoimmune disorders, like Sjogren’s syndrome, can also cause a dry mouth, as can certain medications. In fact, there are over 500 medications known to cause dry mouth, including but not limited to antihistamines, antidepressants, antiemetics, medications used to control blood pressure, as well as sedatives. If you do develop a dry mouth and suspect it may be a result of a medication that you are taking, Dr. Ali Ghahary notes that it is important for patients to know that they should not abruptly stop medications before checking with their family doctor or pharmacist. If medication is a suspected cause of dry mouth, your physician may be able to alter its dosage to see if that makes any difference, or might even recommend a different medication all together. There are also certain things that doctors, dentists and pharmacists also suggest patients try themselves for relief of dry mouth. For example, chewing sugar-free gum or sucking on sugar-free candy can often help to stimulate the salivary glands, drinking plenty of water during the day, as well as using a humidifier in your home – especially at night. Using an alcohol-free mouth rinse can also help. If these home remedies are not helpful and you find that you are still suffering from a dry mouth, your doctor and/or dentist may need to prescribe you with a medication to help the function of the salivary glands, especially if you have any underlying medical conditions – like Sjogren’s syndrome – as mentioned above, in addition to lupus or rheumatoid arthritis. Treating whatever the underlying cause is will often resolve other associated problems. Follow Dr. Ali Ghahary on Instagram for more facts on dry mouth, as well as for more information on oral hygiene. If your face becomes weakened or paralyzed, you may have a medical condition known as Bell’s Palsy. Named after Charles Bell, the anatomist to first discover this condition, Bell’s Palsy can affect anyone between the ages of 16 and 16, and it occurs when the nerves responsible for controlling the facial muscles become compressed, inflamed or swollen. As a result, this can cause one side of your face – or in rare cases, both sides of your face – to become stiff and/or droop. You can also experience other symptoms such as having trouble closing your eyes and having difficulty smiling. Bell’s Palsy usually appears abruptly, and while its exact cause is unknown, it can be triggered as a result of a viral infection, such as the common cold, or even bacterial infections like ear and eye infections. The herpes simplex virus and HIV have also been linked to Bell’s Palsy. You have an increased risk of developing this condition if you are pregnant, have diabetes, a lung infection, or if there is a history of Bell’s Palsy in your family. 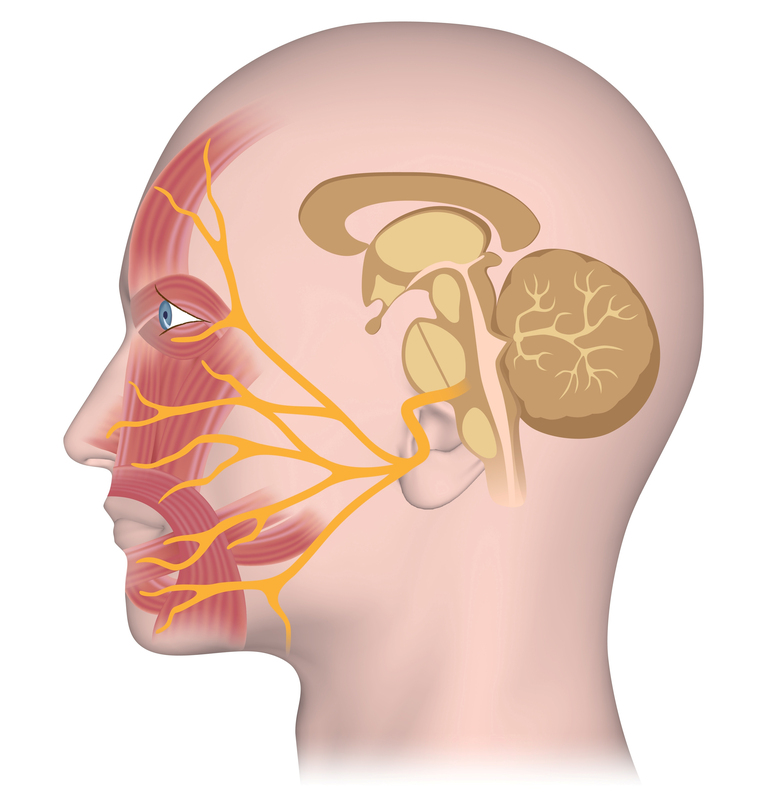 In addition to some of the already mentioned symptoms, it’s also not unusual for an individual with Bell’s Palsy to experience other symptoms, including drooling, trouble eating or drinking, having an inability to make facial expressions, muscle twitches, headache, being sensitive to sound, dry eye, and dry mouth. If you are experiencing these or any of the aforementioned symptoms, it is important that you seek medical attention immediately. Certain symptoms of Bell’s Palsy can mimic those similar to a brain tumour or stroke. In order to diagnose Bell’s Palsy, family physicians like Dr. Ali Ghahary will do a thorough examination on the patient as well as ask questions relating to the patient’s symptoms. You may be provided a requisition for blood tests in order to determine if a viral or bacterial infection is present, as well as medical imaging tests to check the facial nerves. In most cases, Bell’s Palsy will usually go away on its own, though it can take several weeks before you make a full recovery. To help speed along the recovery process, you can try some at-home remedies including holding a moist, warm towel over the face to help relieve mild pain – as well as over-the-counter pain relief medications. If the cause of Bell’s Palsy is due to a virus, you may be prescribed antiviral medication. Corticosteroid drugs can also help to reduce the inflammation associated with Bell’s Palsy.